According to the sacred text ‘Sri Lalitopakhyanam’ in ‘Brahmanda Purana’, Goddess Lalitha Devi formed an army of Goddesses from her supreme divinity and her weapons for the fierce war waged to save the universe from the demon Bhandasura. From Goddess Lalitha’s divine weapon ‘Goad’ sprang Goddess Sampatkari, the Captain of Lalitha’s Elephant regime, holding a sword resembling the eyebrows of the God of Death. From her deadly weapon ‘Noose’ emerged Goddess Ashwarooda, the Captain of Goddess Lalitha’s cavalry, holding a golden rod. According to the scriptures, Goddess Sampatkari riding on a mammoth Elephant named ‘Ranakolahala’ can drive your senses and streamline your thoughts and action towards success and wealth creation. The Sanskrit word ‘Sampat’ signifies Wealth. It is believed that she can help you gather multifold wealth and enjoy the accumulated wealth in the right way. Goddess Ashwarooda riding on a white Horse named ‘Aparajitha’ signifies royalty, energy, speed, intelligence and the power to be invincible. It is believed that she can absorb your negative thoughts and annihilate dark forces that obstruct your material growth and achievements. 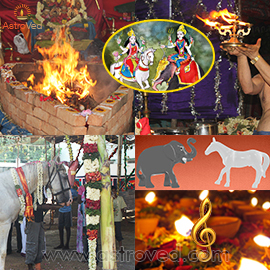 The auspicious homa invoking these two supreme Goddesses can enable you to transform your thoughts, bring in new ideas and overcome business obstacles. It is believed that the blessings of these Goddesses can help you learn from your mistakes and devise a clear plan of action for progressive success in your career. The planetary positions of this day add value in such a way that even a small action taken to grow your career or business on this day can yield exponential results. On this day the Moon will be transiting the star Punarvasu in the sign Gemini. The meaning of the star is “Wealthy again”. This day carries the potential energy of transformation from darkness to light, poverty to prosperity and failure to success. The purpose of the Punarvasu star is ‘Artha’ which signifies ‘generating wealth’. The symbolic representation of this nakshatra is the ‘arrow’. This is an apt day to renew your ambitions, goals, fix your targets and move forward to achieve them. This is also a right day to learn from your failure and start over again. The Moon will be aspected by Venus, making it a good day to seek the blessings of Goddess Sampatkari and Ashwarooda for success and prosperity. By worshipping the Goddesses on this day, they can bless you with the ability to use grandeur and dignity in your approach which can lead to success in your endeavors. 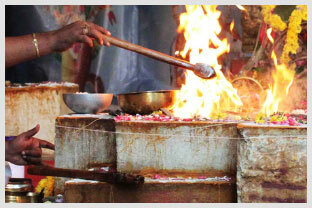 Participate in the rare homa invoking the Supreme Goddesses of success to multiply success in your business & career. The planetary positions of this day also add value in such a way that even a small action taken to grow your career or business on this day can yield exponential results. Your sincere prayers to the Goddesses can absorb your negative thoughts and annihilate dark forces that obstruct your material growth and achievements. You will receive the Durga Suktam chanting download in your order log. You will also receive the listed complimentary product along with sacred grey ash powder from the homa and kum-kum (Red Vermillion Powder), which will be blessed in the rituals. Keep this on your meditation altar and wear it on your forehead during meditation or at other times to expand the Divine blessings into your life. Please Note: Your complimentary product and the Prasad will be shipped from Chennai, Tamil Nadu. Please allow 2 – 4 weeks for delivery after the entire set of rituals is performed. 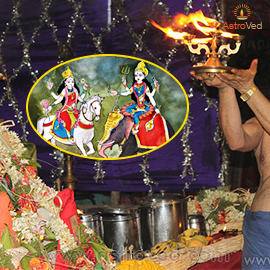 Join us in the rare Multiply Wealth and Success fire lab invoking Goddess Sampatkari, the Captain of Lalitha’s Elephant regime, holding a sword resembling the eyebrows of the God of Death and Goddess Ashwarooda, the Captain of Goddess Lalitha’s cavalry, holding a golden rod. Your earnest prayers to the Goddesses will help you gather multifold wealth and enjoy the accumulated wealth in the right way.